Inter Milan have ruled out a move for Manchester City striker Carlos Tevez and complained about the "crazy" transfer market this summer. The Italian side have been consistently linked with a move for the 27-year-old Argentine over the last few months. 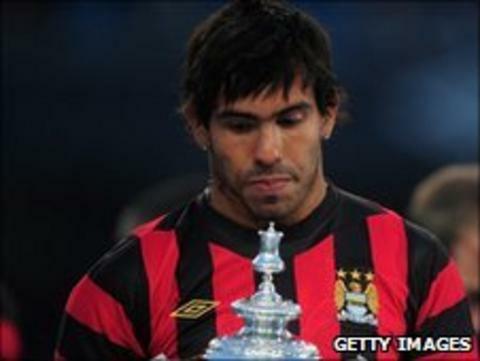 But sporting director Marco Branca told BBC Sport: "Tevez is a great player, a great character, but absolutely no. "His salary means it is out of the question. The market is crazy at the moment and it is hard to compete." Branca said Inter are revising their wage bill ahead of Uefa's financial fair play regulations, which come into force in 2012/13 and require clubs to balance their books if they are to compete in Europe. Tevez submitted a transfer request at Eastlands in December last year - which he later withdrew - and was widely expected to leave this summer. While Branca revealed he is a big admirer of the Argentine, he reiterated there is just no way that Inter can afford him. "He is a great player but a move for him is out of the question," said Branca, who is responsible for recruitment at the Serie A outfit. "We have to organise our finances for the financial fair play rules in the next two years. "We don't have the same revenues from merchandise and match day as the English sides. We are looking for younger players now with great talent, who we can develop." "Take [Udinese winger] Alexis Sanchez, a player we liked," he said. "Manchester City raised their bid for him to 35m euros [£31.2m] plus a bonus, which ruled us out of the race. "In the end, the player preferred to go to Barcelona and they got him for 28m [£25m] and a 10m [£8.9m] bonus. Not many clubs can afford that." Inter are currently looking for a new manager after caretaker boss Leonardo announced he was leaving to join French club Paris St Germain last week. Branca refused to discuss specific names but stated: "We hope to make a decision on the new manager within days." He revealed that the club had been keen to recruit Andre Villas-Boas, who has now been appointed manager of Chelsea. Villas-Boas worked for the club as chief scout when Jose Mourinho was manager. "Villas-Boas likes us and we like him," Branca said. "He was with us for nearly two years but the situation was that he had a clause, like a player. "The release clause was 15m [£13.4m] euros. We don't want to give Porto a job as well as him, so why should we pay them so much? Chelsea were the only club willing to pay that." Players Wesley Sneijder and Samuel Eto'o have also been strongly linked with transfers away from Inter to the Premier League but Branca insisted the duo are happy in Milan. "Sneijder and Eto'o are great players who can change a game in a moment, so it is normal that great teams should be thinking about them but they are happy here and I don't think they want to leave," he said. "We certainly don't want them to."